What's New: Now runs on Windows 7 and Vista. Added Hotkeys. Has 48 kHz pro quality, many more WMA settings and VBR, Auto start with system, Keep on top, Improved recording files and more! This download (easyhiqrec.exe) was tested thoroughly and was found 100% clean. Click "Report Spyware" link on the top if you found this software contains any form of malware, including but not limited to: spyware, viruses, trojans and backdoors. 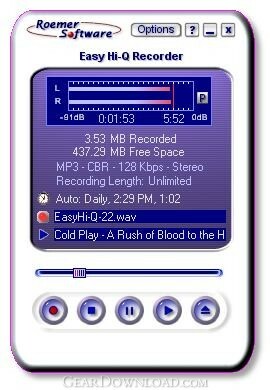 FREE Hi-Q Recorder 1.95 - Free sound recorder software. Record streaming audio, any sound to MP3 for free!